Cryptocurrency can seem like a daunting subject to learn about for even the smartest of people, but it doesn’t really have to be that tough to pick up the basics. 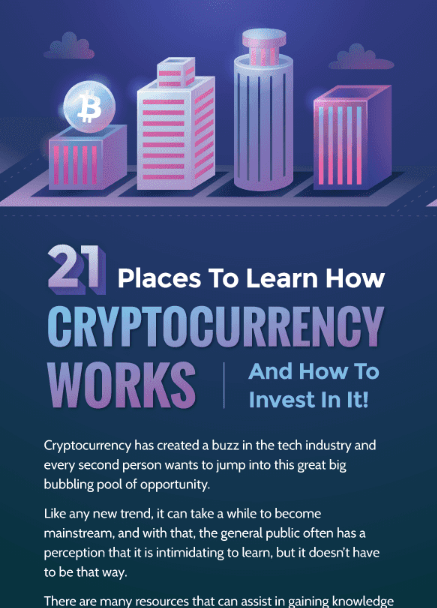 There are plenty of places to learn about this new technology both paid and free and in this infographic, we take a look at the best of both. With regards to the free methods of learning about cryptocurrency, you have podcasts, forums, crypto websites, documentaries, and of course, YouTubers. If you are looking for something a little more structured and don’t mind paying a little bit of money for your crypto education then there is also the option to either buy either book from Amazon or some of the excellent courses supplied at Udemy or Coursera. Whatever your preferred method of learning, you are sure to find something that is suitable for you in amongst the options on the infographic.